Google’s new Chicago HQ began its life riddled with ice. The building’s industrial past informed its current design. 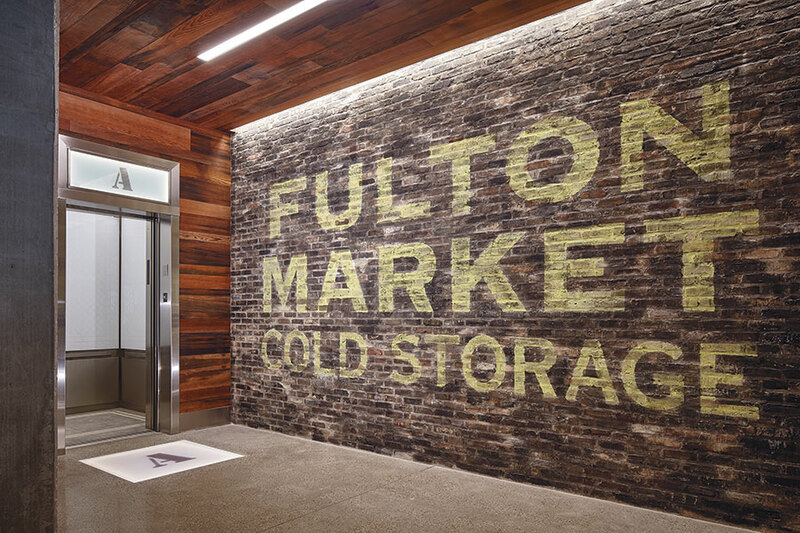 1K Fulton, an adaptive reuse of the Fulton Market Cold Storage warehouse at the intersection of Chicago’s Morgan and Fulton streets, is the evolving district’s tallest building, a distinction that will probably stand if two pending historic designations—a landmark district and an innovation district—win City Council approval. The 531,000-square-foot project is the future site of Google’s Chicago office, but other techie tenants as well as a few retailers and restaurateurs are also dropping anchor there amid the area’s meat distributors, art galleries, and dining destinations. An infusion of roughly 2,000 daytime workers holds promise for Fulton Market as a revived employment center. Developer Sterling Bay, which has multiple interests and holdings in the area, including an adjacent site approved for a boutique hotel (reportedly the Ace Hotel), hired Hartshorne Plunkard Architecture (HPA) for the shell and core design, and charged it with the task of wedding the existing 10-story building to a new six-story annex peppered with terraces and a social roof deck. VOA, meanwhile, is cooking up Google’s interior design. The tech giant plans a November 2015 move-in. 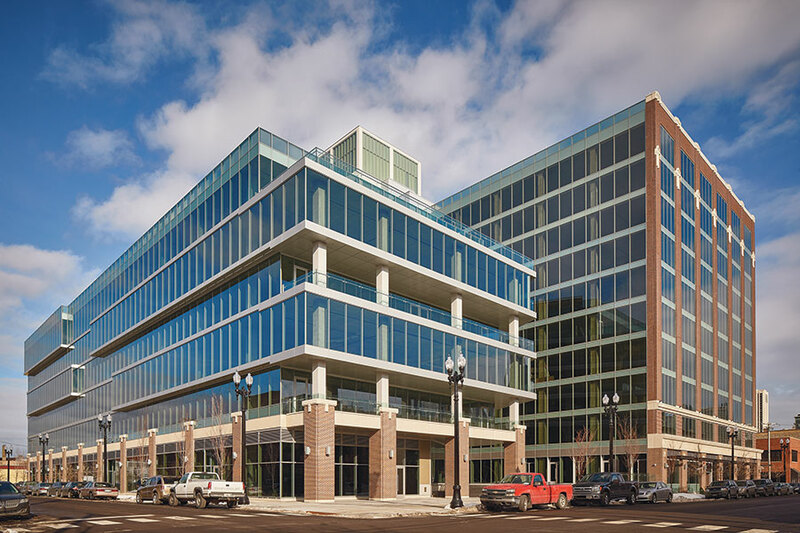 Several office tenants will arrive in late April and ground floor leases are being hammered out for the fall. Brick precast framing addresses the solidly brick Fulton and Morgan street walls, but the treatment subsides on the existing building’s west face where conversation is with the annex. 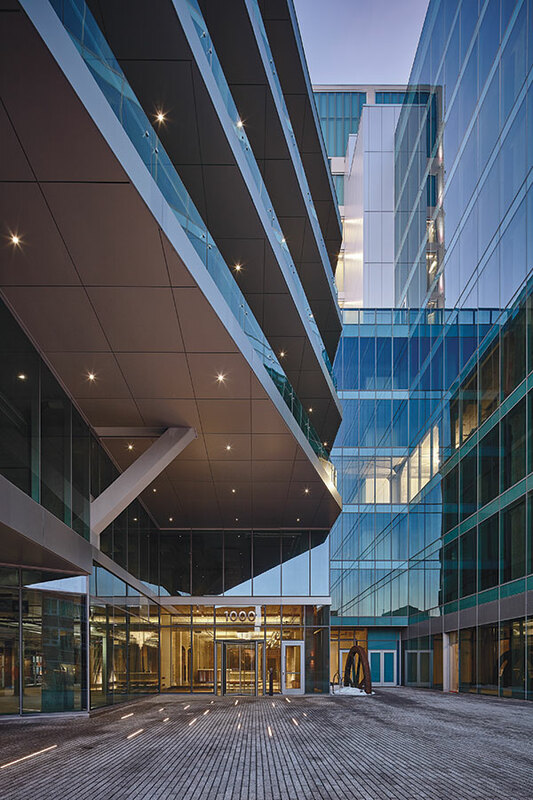 At this concave joint between old and new, each structure is splayed open to highlight internal connectivity. A dissecting cut to the existing building exposes concrete slab floors and pillars. Brick bore the brunt of the freeze-thaw cycle when the building was a cold storage warehouse. “There were literally hundreds of trucks lined up around the block to cart off debris,” said Patrick O’Connor, a principal at Sterling Bay. On the other hand, 98-percent of the concrete was reusable. 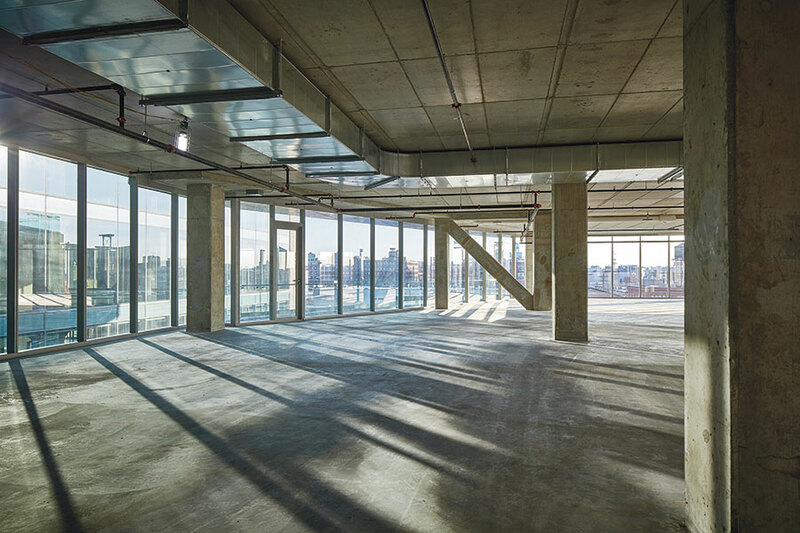 The unadorned materials include details like the seats of rebar peaking through concrete ceilings. It would be easy to over-commit to cold storage imagery. 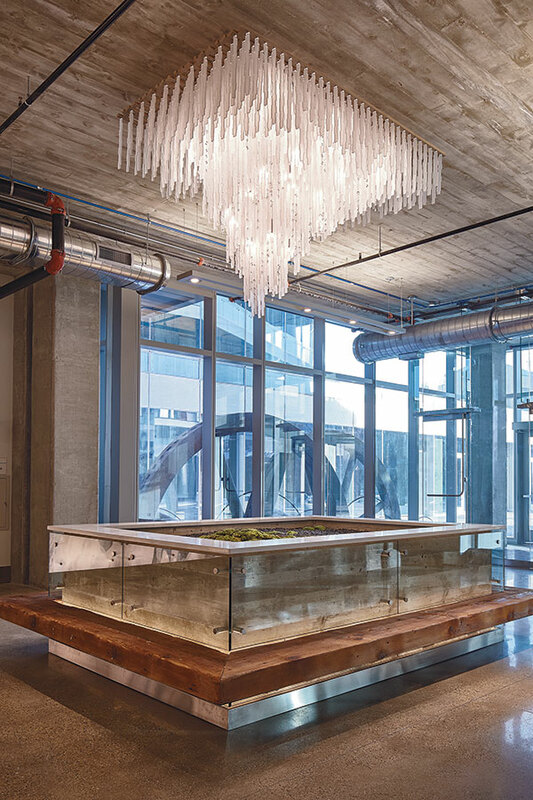 There are two pieces of decor that nod to past use: the annex lobby’s stalactite chandelier and billboard blowup of the untamed frozen spaces captured before the big thaw. They are potent crystalline presences, coexisting with playful odes to a more generalized industrialism: benches shaped from old timbers, compressed pallets, or glass; a moss-filled concrete planter; and swings hung from meat hooks—“meat modernism,” as HPA partner Tom Pope dubbed it. The phantom surfaces appear elsewhere. 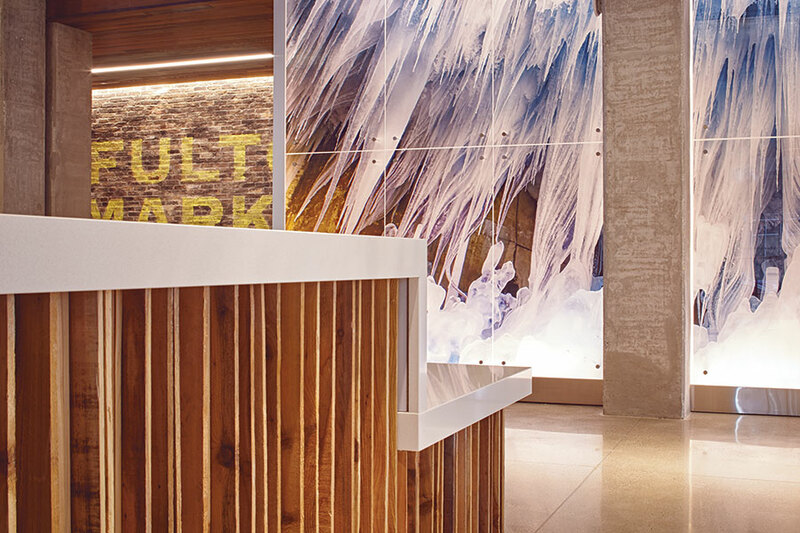 Peeled back exterior brick, exposed concrete, and glass planes blur old and new on most levels, but a weathered, moveable simulation of the old wall divides the lobby into Google’s and everyone else’s spaces. Elevators with efficient destination dispatch technology are also divvied up in this way. 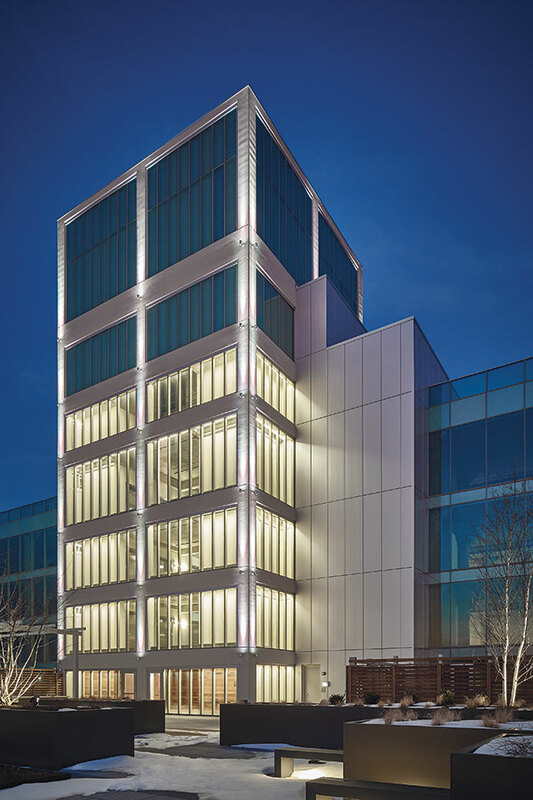 The elevator tower’s glass curtain wall has vertical lines of ceramic frit so the eye sees textured channel glass from afar without disrupting sightlines for workers inside. Most astounding is the panorama from the fifth floor up—better than the views that can be obtained at 30 stories in The Loop or River North. The experience is one of vaulting from the 19th Century straight to the 21st with the historic grain of the neighborhood at your feet. For passersby, the interest is integrative (as much as any glass cube can be). To that end, HPA added a series of projecting elements on the annex to articulate the facade where it meets textured low-rises. “The horizontal scheme breaks up the massing,” said Pope. 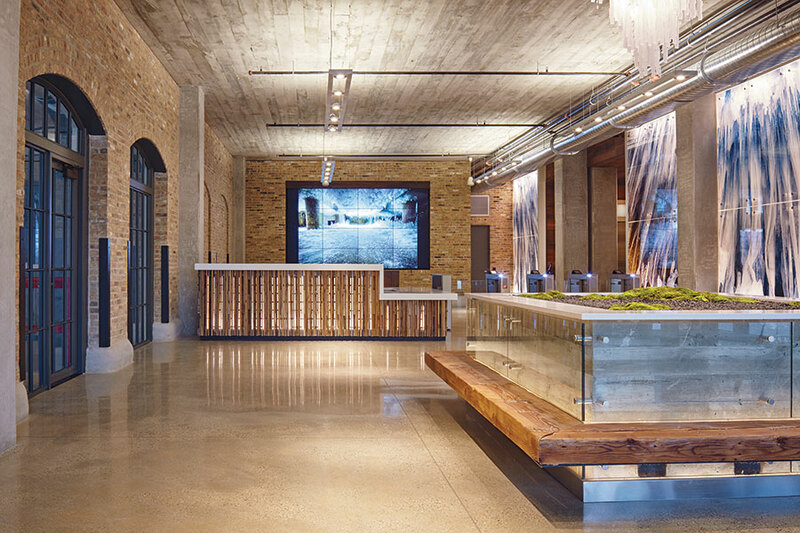 Attention-grabbing lighting sells the project after hours, while giving the site a sense of permeability. Google and other alternative companies are drawn to older urban fabric and the industrial stock of yesteryear, which accommodates their freewheeling tendencies. O’Connor said 1K Fulton’s commercial rents are on par with The Loop, and the project is almost fully leased. That is a crystal clear indictor of the desirability of Fulton Market, where a New York investor recently bought out yet another former meat packer. It falls on the city to maintain a superficial semblance of the old Fulton Market of forklifts and freight as the economic engine reinvents it.